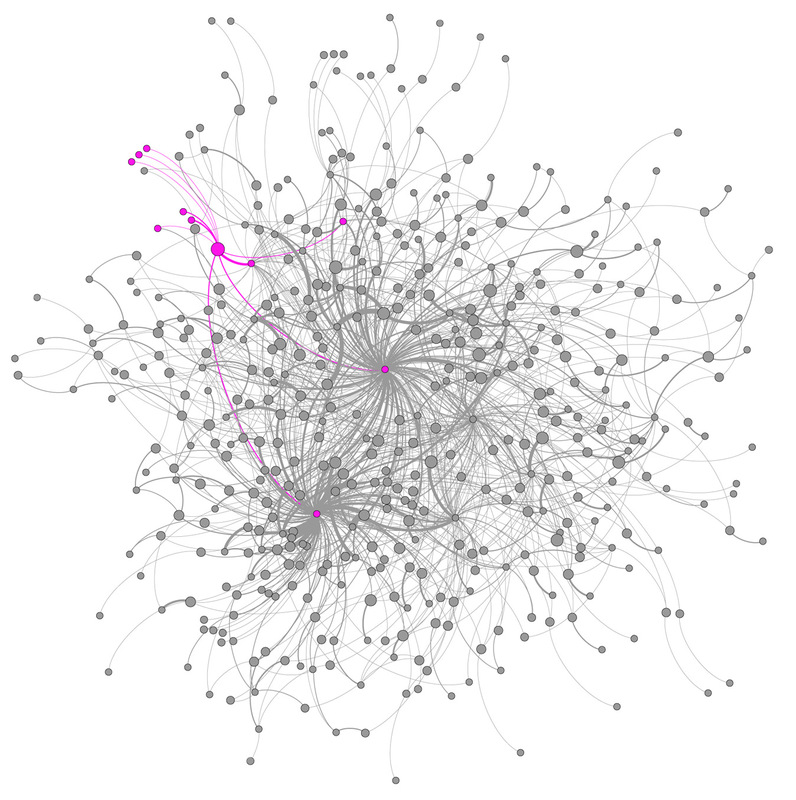 We have been commissioned to put together a network analysis report of the EdgeRyders community. We’re presenting some initial findings to you - the Edgeryders community at large - for your input, thoughts and to ensure that everyone has a better overall view of how discussions taking place on the ER platform - through comments and mission reports- govern the shape and direction of the ER network itself. In the age of “Big Data” it’s common practice for companies, brands and in particular online social network platforms to conduct this kind of research. They generally seek to understand the network and to identifying key individuals such as ‘bridge nodes’, network weavers and key influencers. This research is predominantly done with a view to growing the network in question through targeted marketing, incentivising the actions of key influencers and by shaping the product or service according to the actions of users. But as we know, EdgeRyders isn’t your typical product or service, it’s a discovery exercise, driven by dialogue and exchange with a view to transforming that knowledge into the largest thinktank in the world. Below is a birdseye view of the active EdgeRyders community. With 771 registered users, as of 7/5/2012 148 were actively participating and communicating with each other. 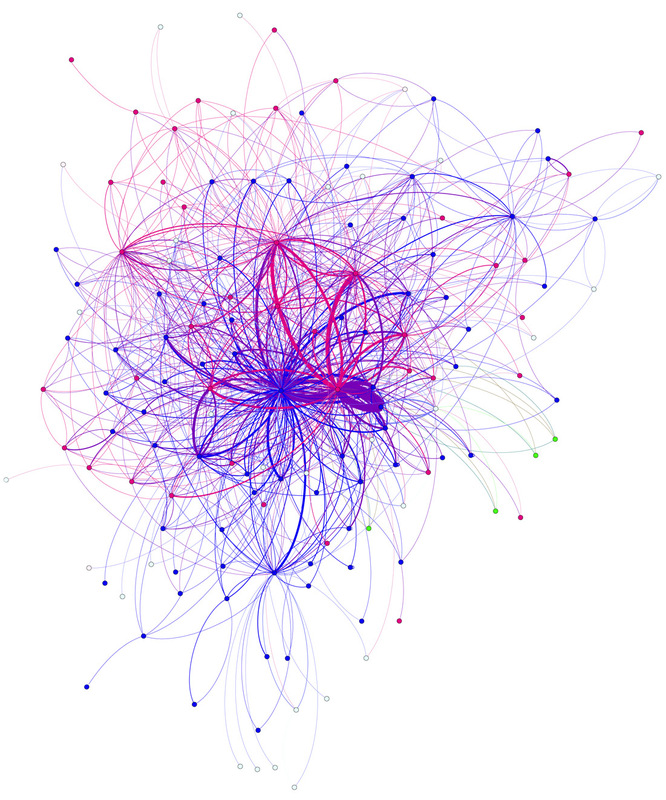 The visualisation below illustrates the active individuals and who’s talking to who. 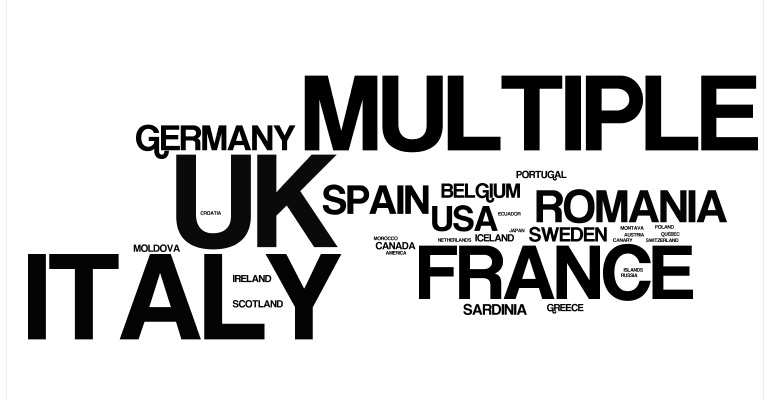 Having taken an overview of the network, we have initially identified 7 sub-communities. 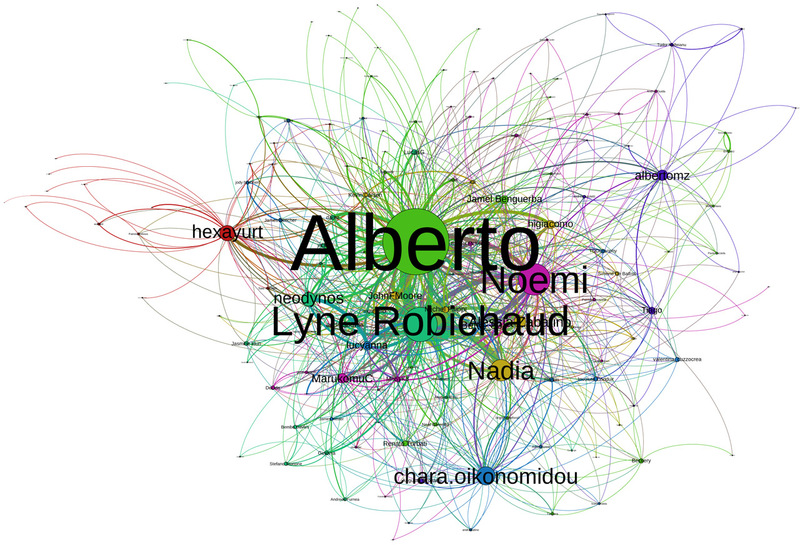 The key nodes within each of these 7 sub-communities are currently EdgeRyders staff: Alberto, Hexayurt, Nadia, Chara, Lyne, Noemi and Albertomz. Looking at the sub-communities forming around these individuals, there is a clear indication of the existence of a second wave of key nodes. The community is grown through a snowball effect: it seeks to encourage the invitation of friends of friends. In order to better understand how the community is evolving and to support this claim, it would be useful if you all could provide some feedback and discussion on how you’re bringing others to the platform - whether that be by pre-existing offline network, twitter, email or other means. 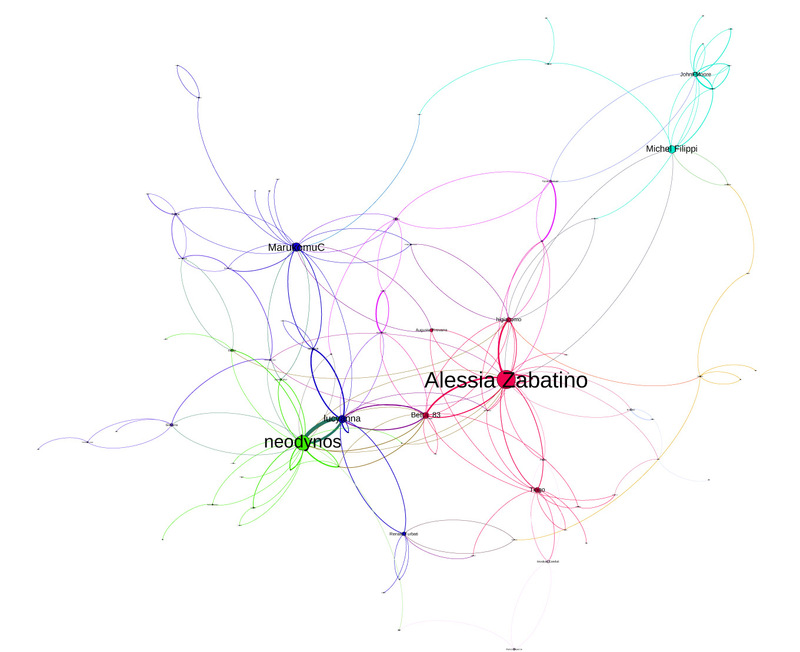 Through looking at both numbers of connections and at who acts as a bridge between otherwise unconnected people we can see 10-15 emerging key nodes: most evident are neodynos, Alessia Zabatino, Michel Filippi, JohnFMoore, lucyanna, Jamel Benguerba, Tudor Mafteianu, MarukomuC, Betta_83, Tiago, LucasG, higiacomo and Renato Turbati. The Second Dataset, Mission Reports. The second dataset we’ve been analysing is focused on the discussion between Mission Reports. This analysis reflects an increasingly less centralised form than illustrated in the initial dataset of all interaction above, however the pattern of the ascendant 7 individuals/nodes noted before is by and large replicated. 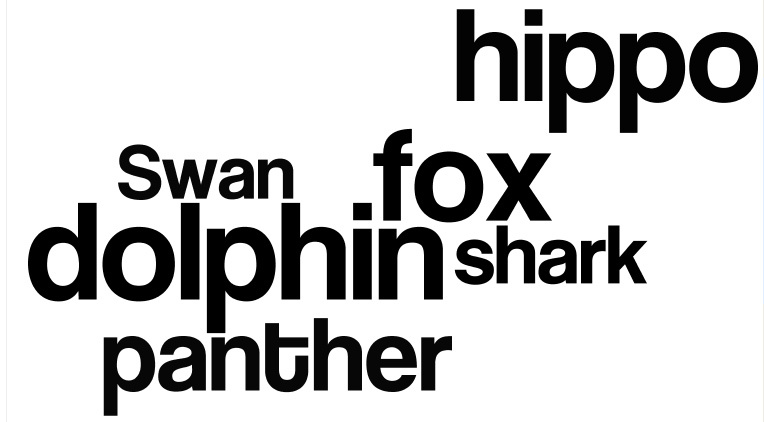 This week we compiled a database that includes gender, location and animal type for all 148 active members. This was done by correlating user id with information provided on individuals profiles, EdgeRyders doesn’t require you to input this information and so this shouldn’t be considered a complete dataset. By doing a rough cut, we found that there were 50% more men than women. But we also found that, on average, women have written on a wider range of mission reports than men. Where given, which Cities EdgeRyders are located in. For the most part we’re using data extracted directly from the EdgeRyders website’s database, this includes a list of all users, directional interaction between users, the frequency of communication between individuals and the frequency of interaction between users and specific mission reports. 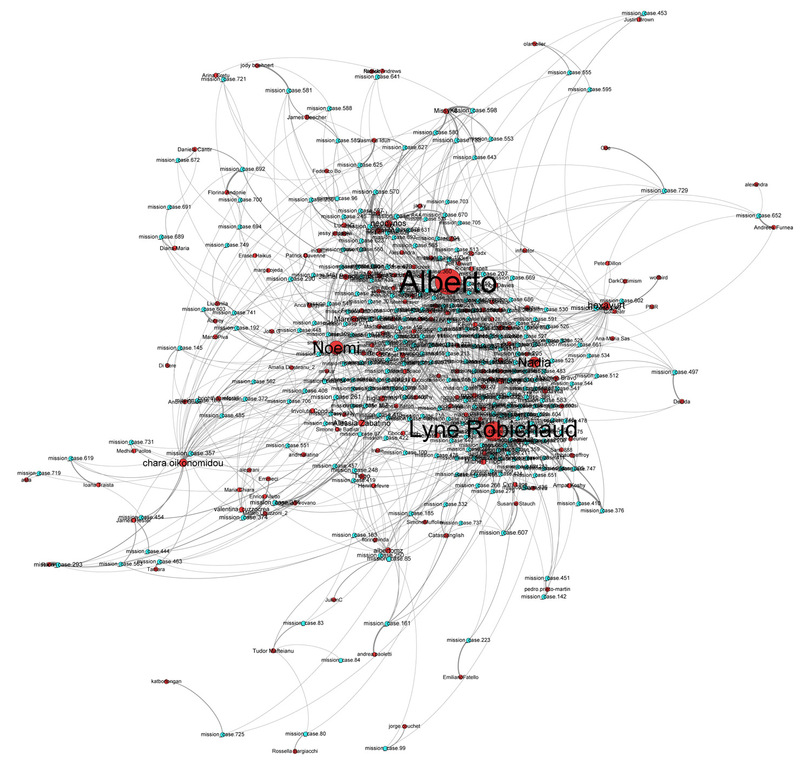 We’re using a combination of Gephi (free to use open-source network analysis tools) and UCINET, to analyse and visualise the data provided. We will be giving a presentation at the EdgeRyders conference of our findings and a short time after will present a full report. In the meantime we look forward to your input and discussing our initial findings with you! This is all really interesting! I am extremely intrigued especially by your person-to-mission report graph. We should partition reports according to the mission, and color-code the reports according to partitioning class or even try to reduce the network, replacing the 350 mission reports with the about 30 mission briefs. 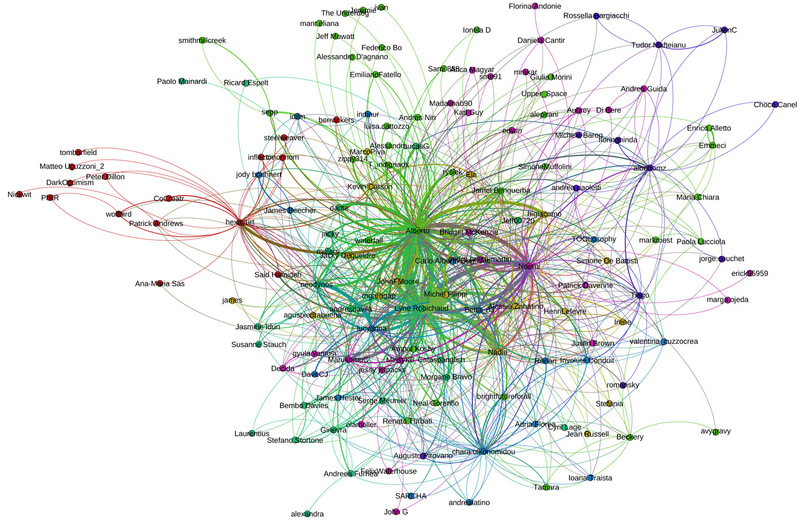 This would give us a visualization of how tightly topics are connected to each other. With what army of data-monkeys? Great idea: do you reckon there is an automated way of doing it? I think Ben may sulk if he needs to do it by hand! But definitely the way to go… re: the gender stuff, my hunch kinda is that it is linked to women having more horizontal and less specific interests, thus commenting on a wider range of things?! I dunno, but would be good to find out! Well, we might get Luca in the Dragon Trainer mailing list to do an export with a partition. The database of ER knows the mission brief associated with each report (reports are nodes; they belong to a group, and that group is the brief). So he can highlight that information using Views, and from Views he can do an export with that information… provided that he updates the code that maps from Views to the file that then you guys import into Gephi. The beginning of the end of devaluating the other? I find these initial findings about women quite fascinating. Women are more confident? I did not see it coming… If that is so, can these findings lead to more exploration, tend to reach more balance in gender equity, decrease gender discrimination? Are these findings a hint, evidence that women are capable of leadership, a leadership equally effective as that of men? Is there potential here to overturn preconceived ideas about women? In their initial role, women have been supposed be cooperative, supportive, understanding, gentle, and of service to others. Women have supported family, friends, co-workers and neighbors. The wider interest of women may be explained by an ability to pay attention to the other, of being less focused on oneself. Women have always been the caretakers of society, by providing for basic needs, remedy injuries, making peace and in general playing the unique and essential dual roles of (superstar) supporter and (underrated) leader. Female leadership has been characterized as being less abrasive and transformational. However, in society in general, transactional leadership is more rewarded than transformational leadership, contributing to the lack of advancement of women. When women will be valued for what they really are instead of a having to live up to longstanding perceptions, when women will no longer be penalized for their transformational leadership, it could be the beginning of the end of constituting the self by devaluating the other. One thing I’m particularly keen to understand and gather from this thread -as highlighted in the post- is to understand how individual connections on EdgeRyders relate to their offline networks. Since this kind of relationship is generally pretty opaque on any online social platform, it would be great to hear about it. What motivates you to invite someone to join EdgeRyders? What sort of person do you think benefits from and can contribute to EdgeRyders in your offline network? and when they do join do you communicate with them more than others? Ultimately in this context, I’d like to understand how this effects the formation of the sub-communities. From my experience, I invited my friend Felix Waterhouse to join EdgeRyders because I felt the work he was doing is an important part of this conversation but also because he perhaps represents someone that is adverse to taking his discussion online - social networks, twitter etc are not things that for him function in his daily activity. My feeling and experience of many individuals who ‘ride the edge’ is that this is common - those i’m closest to that are most active in trying to instigate (and force) change, don’t use facebook, they don’t use twitter and trying to convince them to contribute to an online platform is a pretty difficult feat. Do you think this is true for online discussion generally, that there is always an inherent network bias towards those that favour a particular kind of interaction? It seems apparent in this thread that such suggestions are already being made in relation to gender. How many people do you know on EdgeRyders IRL Alberto? Are these professional relationships or friends etc? Of these, Augusto and Medhin are friends-friends. Alessia is a professional acquaintance who has become a friend. The others are professional acquaintances on their way to becoming friends (I hope), but I knew them before starting Edgeryders. Now that you mention it, most people in Edgeryders I met through Edgeryders itself - even though I am starting to think of them as friends. Many, of course, are FOAF: you yourself I know through Vinay. But Vinay I know through Nadia, and neither of us knew him before Edgeryders! Whoa, the findings about women are really interesting! I’m interested by the fact that there are twice as many men, but the women spread out more effectively in the community. Ha ha! It’s just like in real life, isn’t it? The woman behind the man?! Your findings seem to be going in the same direction as studies demonstrating that women better understand social media in general, and that women also have a better understanding of open government. Women perhaps better understand stuff like networking, listening, making links, empathy, caring, sharing, etc. Do you think that you would obtain equivalent or different results, if you removed the Edgeryders staff from your analysis? I see that these findings could become an important element for open government guidance. There are presently few women in the open government.sphere. It is composed mainly of men interested in techno, with a much lesser degree of thoughts devoted to strategy. In a think tank such as this one, the focus goes to ideas and strategy. Do you think that women, if they were given the opportunity and the freedom to be themselves, could be encouraged, via platforms such as this one or projects of similar nature, to propose and help build political systems and, ultimately, society, in a different way? Could women be built in a collaborative plan, so that they would contribute to engage men, or ‘educate’ men, so to speak? The numbers show a portrait of gender balance, but in reality, there is an imbalance. I don’t know if you see what I mean… How can we enhance and increase the beneficial results obtained by women, and strive for balance? Behind every (wo)man there is… another woman? women are more affected by their networks. Other work shows that woman are affected by the shape of their networks - if they are dense or sparse - in a way that men seem to not be, and that they are more likely to suffer if they have too many connections, suggesting that they invest themselves in their social connections more. I read your comment with great delight. It sent a puff of joy exploding in my head! This week, I was trying to explain exactly this, the-power-through-connection-not-dominance, and what I said was not understood at all. I explained that the current model of power is based on PREDATION, a masculine point of view: conquer, manipulate, dominate, defeat, win. It has worked in the past, but its life is coming to an end. This model has a brute force kind of way, but it is hypersensitive, over-reactive. And I suggested an alternative power, based on HEALING, a feminine point of view: a force acting and pushing the evolution forward, an intelligent and motherly energy which can do no harm. A healing force, always acting in a gentle manner, reservoir of personal power, available to each of us. This force exists through connection, inner connection. Attaching greater value to connection could be a first step toward this alternative model of empowerment. Of course, people who will receive this data analysis will read what they want in it… I see potential, something I’ve been waiting for a long time. There may be an important track to explore here??? Yes … but maybe this generation can do away with male-female? very briefly. and yes. We must get rid of a zero-sum understanding of power: “i take your power, so you do not have it” and move towards an idea that power can grow exponentilaly, it multiples, it is more like a wave-form than a force in the Newtonian sense. This masculine vs. feminine worries me. If there was no gender difference, we would not be classifying participants between the blues and the pinks. What makes you uncomfortable? I probably poorly explain my reasoning. Every human being, either male or female, has the same possibilities, with respect to a force, described by the ancients as female, since the beginning of time, since the apparition of the first human beings. This force has very deep quantum roots. Have you observed the characteristic in an atomic structure? Although an electron is neither male or female, in our sense of the word, it however exhibits certain characteristics of a female force which we term negative, in the magnetic sense. Please forget about all of this. Forgive my intrusion. Let us stick to observe the blues and pinks, and their statistics. Edgeryders is an experimental project. We cannot analyze everything. The project terminates at a specific point in time. It is hoped that the Edgeryders data will be used for other purposes, further analysis, for further experimental projects. He also observed that “there seems to be an overwhelming majority of men among the government 2.0 evangelist community”. There is an explanation. Are prepared to consider it? There is an explanation, a way to get rid of what could make you uncomfortable, about the female-male understanding of power. There is a process which fuses two poles into one. I agree with you. There is something which grows exponentially, in a wave-form. But the authorities are not comfortable with this idea. Or is it because it is not understood? Explanations were given on this platform. More explanations are needed, until it is better understood. We can explain it with quantum vocabulary. I base this on my personal experience, as is the tradition at Edgeryders. It can be compared, it is similar to the release of energy within the atom through atomic explosion. Two poles of energy unite and the expression of that unity becomes a third force, which results in a transmutation of basic energies to an entirely new level. the one on women/men proportion is pretty intriguing and I think it actually rapresents reality. I’m no ‘expert’ in this field. I certainly don’t have an acceptable scientific explanation for this. But I have field experience! Two weeks ago, I was invited as guest speaker at a conference on open government (in Quebec, where there is technically no open government yet). A full day conference, from 9am till 6pm, to discuss these issues. This event was not organized by the government, and no government official bothered to attend. I was given an 8 minutes time frame, to present the Edgeryders experimental project, which I consider works and delivers good results. Another woman was given 8 minutes to talk about her analysis of the tweets of the Canadian federal governments (her message was basically that this gov doesn’t tweet much, and the days where occurs major releases of information, like the national budget for instance, the tweeting rate goes down by 89%). The rest of the day, guess who talked? Men, men, men, men, men, men, men, men, men, men, men, men, men, and more men. Sometimes, there were panels of 8 men sitting next to each other, replaced by more panels of more men. For hours, from 9 to 6, men talked (and listened to themselve talk). To the point that the few women attending this conference, all incresingly started to look like red Angry Birds faces. A women (not me!) jumped up on her feet, like a fire cracker, and demanded to have the microphone. She asked bluntly, with no link whatsoever with the conversation, and it was not even the question period: ‘Why are there no women speaking today? Why do we have to listen to men only?’. The men’s faces went white. They did not know what to say. In ‘traditional’ meetup places, where the citizens are allowed to speak about the relationship between governments and citizens, why do men usually occupy the room? Could it be that in non-filtered environments, like Edgeryders, and perhaps other social media opportunities, women find the space and the freedom to be who they are, and speak as much as they would like to? Are women given enough opportunities to express themselves, in their daily tasks, in all that they do in life?